"In the beginning God created heaven and earth"
"…and there was evening and there was morning"
"…and while man was sleeping…"
"....he also made the stars....."
"…and everything that has the breath of life in it..."
Alte Kalköfen Lodge offers 10, double or single, bungalows, built on the edge of the Gurib river, overlooking large Camel Thorn trees growing in the river bed. Needless to say, the spectacular surround provide inspiring and exceptional sunrise and sunset views from the comfort of your room. All units are equipped with comfortable beds and en-suite bathrooms. Breakfast included for overnight guests. The road less travelled in this case, is truly the best route taken… Alte Kalköfen is a masterpiece. For an authentically unique place to stay, look no further than Alte Kalköfen. 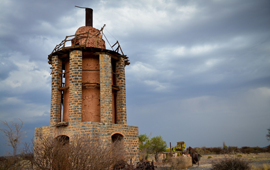 The “Old Lime Kiln” Lodge is arguably one of Namibia’s best kept secrets! 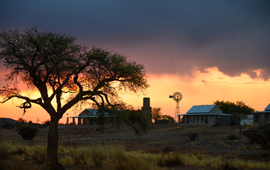 Situated between Namibian towns of Keetmanshoop & Lüderitz, the lodge is the perfect central base for planning trips to surrounding attractions like the famous Fish River Canyon. Rich flora also calls all intrepid botanists (and novice onlookers alike), to come and marvel at the natural beauty of this region. The lodge is well known for its fascinating collection of Lithops (Cole Lithoparium), also known as “Flowering Stones”. 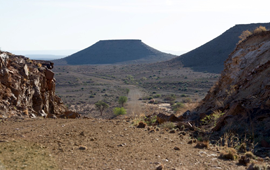 We proudly host the biggest registered collection of Lithops in Namibia. 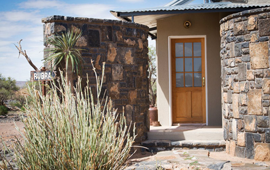 Alte Kalköfen is Owner Managed and offers a truly welcome respite from the long dusty roads. It’s ideal for a lunch stop, overnight accommodation and provides an exquisite wedding & function venue! S 26° 49’ 30" E017° 21’ 07"